I chose to have the wandering wedding dress in Bavaria Germany because in 2017 we visited this area for the very first time. We didn't know what to expect and had visions of the sound of music mountains, cows with bells clanging, and lots of beer drinking. There were definitely incredible mountains, cows with bells in the summer pastures, and refreshing beer available, but there was also so much more and it turned out to be one of the highlights of our year. Schliersee is a small town, one hour from Germany’s capital Munich, that hugs the shore of one of the many picturesque lakes in Upper Bavaria. We visit during the summer months but it is also renowned for its excellent skiing during winter. The Bavarian Alps are nestled next to the famous Swiss Alps so you can expect long ski runs, endless cross-country skiing options and lots of snow adventures. In the summer months, it’s all about soaking up the sun by the side of the lake, boating, festivals, historic site seeing and filling your lungs with the fresh mountain air as you hike or bike through the many scenic trails. It's impossible to capture the depth of the beauty and the true green of the countryside in photographs without retouching them and I don't have time for that but hopefully, these few pics will inspire you to add Schliersee to your travel itinerary. Generosity, family, and festivities are the words that come to mind when I think of the Bavarian people. Almost on a daily basis, we got to witness these traits as we spent more time submersing ourselves into the spirit of the local people. The culture is rich in ancient traditions based around family and also quite an influence of religion. What we found most enjoyable is that these traditions are embraced equally by the young and the old. It’s nothing to see young and old men walking the streets in their Lederhosen (traditional leather shorts) and the girls in their Dirndl (traditional dresses) not because there is a festival on that day but simply because they are proud of their heritage (and they are comfortable too). You might expect like we ignorantly did, that the Germans would be an uptight bunch who were strict on rules and regulations being adhered to. Granted, they like things to be done efficiently (one of the best airport processing through customs) but so do I so I can respect that. But in contrast, we found the Bavarian locals to be the most hospitable people we have met in a long time. During our summer month, we got to experience festivals, fabulous food, hidden local hot spots and some of the best beer in the world (and the cheapest thanks to their bottle recycling system that credits you back a substantial percentage of the cost). Oh and for the adventurous amongst us, there is no shortage of things to keep you amused from tobogganing down a steep mountain, mountain biking a dangerous trail, and flying through the air on a giant flying fox, through to jumping off the side of one of these great mountains with a parachute strapped to your back and hoping to heck you get an upwind. The people were eager to help with anything you might need and passionate about you experiencing the best things their area has to offer. We thought that perhaps it might be just because of where we were staying but once outside the grounds this desire to share their best with you continued. A special mention must go out to the incredible staff at the Karma Bavaria resort where we stayed. For two years in a row now we have been treated like part of the family and it’s true what their tagline says, they really do create experiences. Everyone from the cleaning staff and reception staff all the way through to the restaurant and bar staff all seemed to have one mission, and that was to ensure we had an enjoyable time. And trust me, we certainly did test them with unusual requests such as the need to find a friendly cow, deal with customs, and find a nail artist all in the same day. With the challenges of the language, combined with my procrastination (caused by my inherent shyness) it came down to the last sunny day available to do the wandering wedding dress shoot and I still hadn’t managed to lock in a photographer. Then I had a thought. Following my gut, I popped a note under the door of some lovely local Bavarian guests we had met earlier who had entered the resort with their beloved golden spaniel in tow. Of course, with our love of all things Spaniel, we struck up a conversation straight away. Their two daughters were staying at the resort and it turns out the eldest has a secret passion for photography. Not only were they excited at the prospect of photographing me for my crazy wandering wedding dress idea but once they learned of my nervousness of being in a wedding dress in the public eye, they got dressed in their Dirndl so I would feel more comfortable. How lovely is that! Once again, another testament to the kindness and consideration of the Bavarian people. We had a wonderful few hours together with lots of laughs, adventure and a little bit of stress when it came to catching the last gondola of the day (if we missed it we would have been hiking down the mountain in my wedding dress for the next three hours!). And although we ran out of time to do photos by Schliersee Lake and with a friendly Bavarian cow, I’m sure you will agree they managed to capture some absolutely stunning images. After taking a few photos at the Karma Bavaria Resort we drove the fifteen-minute journey to the base of Wendelstein, one of the many local mountains. The difference with this mountain though is it has a gondola to take you to the restaurant at the top of the mountain, a picturesque church, and some of the most breath-taking views of the local area. You can also get there by hiking one of the many trails or via the cog railway from the other side of the mountain. Or you can do a combination of catching the train, gondola or hiking up (3hr hike, imagine the glute burn after that!) and then the gondola, train or hike down. The local free tourist buses can take you to and from the base as well. Once at the top of the gondola you can then hike the last bit to the lookout and weather station at the absolute top of the mountain. There are a lot of stairs so it’s not for the faint hearted but well worth the effort if your fitness level is adequate. We had a bit of a challenge with the parking meter when we got there and arrived just as the second last gondola was leaving. This meant that by the time we got up to the top we only had twenty-five minutes before the last ride down the mountain left. Hmmm no pressure! My trusty photographers were busy snapping away and keeping track of time while I graciously got swept up in the smiles and well wishes of onlookers. Everybody loves a wedding! I think it’s that idea of finding true love and the promise of together forever. 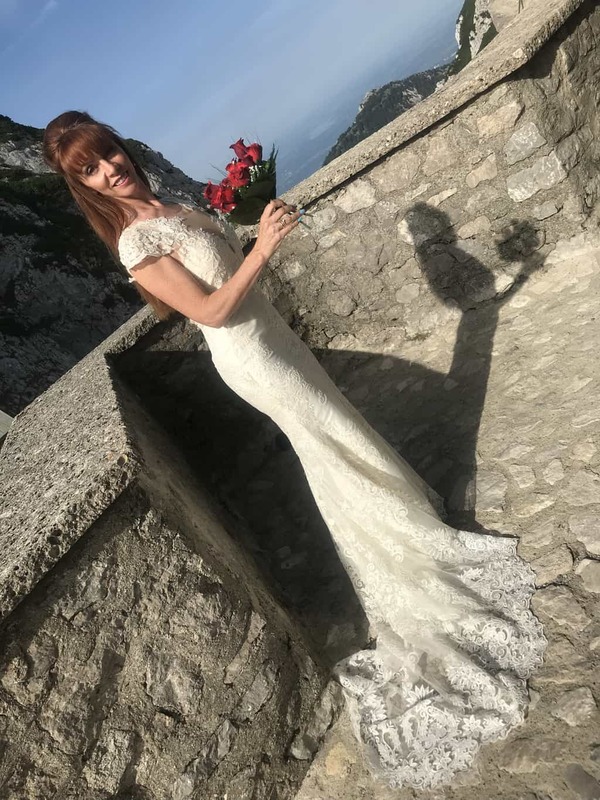 As the time ticked by way too quickly and with only a minute to spare I had to hoick up my dress and veil and make a beeline down the mountain track in my heels. Quite a funny site but we made it and were able to enjoy the ride down the mountain before heading off to our next location. Our next stop was the Josefsthaler Wasserfall (Waterfall). This is a spectacular little waterfall that's only a ten-minute drive from Schliersee and then a five-minute walk from the road. Parking can sometimes be a challenge, especially on the weekends during school holiday season but it’s worth the parking frustration. The path is framed by trees so it’s the perfect alternative when you want to escape the summer sun for a while. It follows the gurgling creek and it is one of the few waterfalls you can easily get up close to without getting wet. Perfect for the wandering wedding dress photo. I had first been inspired by the Josefsthaler waterfall when a friend showed me a picture of it frozen in winter. When I saw it in all its glory in summer I knew we had to have photos here. The walk is fairly easy but in order to get up close and personal with the water you would either need hiking boots for sturdy footing or do what I did and take your heels off and wear bare feet. We first did some photos on the left side and then I got brave and by lifting my dress and vail up I was able to tippy toe through the water and even though it was the middle of summer, it was still freezing cold. Standing on the other side required standing in the water a little and by the end of the photo shoot, my toes were a little blue. Was it a wolf that joined us on the wandering wedding dress photo shoot? As we ventured back the light was starting to fade and night time was beginning to sweep over the mountain. I was walking ahead to enable my trusty photographers to take some snaps as I walked through the forest floor. I came around a corner and there was what I thought was someone’s dog sniffing at a log. He looked up and I took a breath. He had the colourings of a wolf I thought but quickly put the thought out of my mind as ridiculous and replaced it with “his owner must be nearby”. Our eyes met for a moment as I outstretched my arms behind me to protect the girls that were now coming up behind me. Then he turned and briskly trotted away around the next corner. I told the girls to stay where they were and then I hurriedly went to the corner expecting to see a man and his dog but there was no-one there…had I just seen a wolf? As we busied ourselves departing from the scene I shelved that thought until later. We had run out of time to do any more photos as the girls needed to get back to their parents for dinner and we were about to lose the last of the light. The lake photos and the ones with a friendly cow will just have to wait until next year. As for the wolf…a little bit of research told me that it most probably was. When I told the girls later that week we shared the same thought…wouldn’t that have been a great photo! The one of girl in the woods in her wedding dress with a real life wolf, not the one of us all getting eaten LOL.